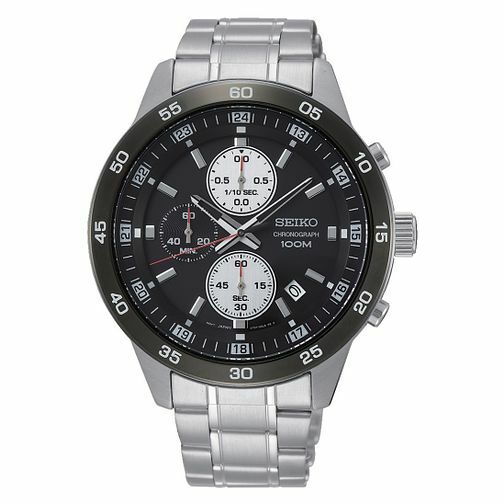 A robust men's chronograph watch by Seiko. Crafted from stainless steel, this timepiece boasts a quartz powered black dial, with contrasting white subdials, made by the inventors of the Quartz crystal. A date display window sits at the 4-o-clock position, whilst sleek silver tone hour markers and hands co-ordinate with the case and bracelet, which is finished by a three-fold clasp and push button release. This timepiece also boasts water resistance of 100 metres.